We’re thinking a lot about the future these days, through the lens of the past. Turn the time machine back to 1976. We were novices in local publishing back then, at a time when the world of communications was on the cusp of radical transformation. (Remember, Steve Jobs and Steve Wozniak didn’t even incorporate Apple Computers until January, 1977. The launch of the first Macintosh was still seven years away.) 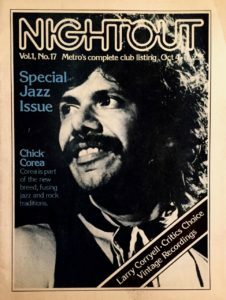 Nightout Magazine, our weekly celebration of Toronto’s burgeoning music scene (back when the El Mocambo was the diva of destination clubs), was put together, quite literally, with wax and exacto-blades. Flip through back issues and you’ll find a treasure trove of cultural trivia – hey, you could see Ella Fitzgerald at Massey Hall for only $12! In 1976, Elvis really was still with us. Pierre and Maggie Trudeau were still an item. The original Star Wars was still in production and Saturday Night Live was just launching season 2. No-one owned cell phones much less surfed the web. Yep, there’ve been a few changes. Several decades later, we had the good fortune to get some sage advice from our professional forecaster friend, Paul Saffo, former head of the Institute for the Future in California. In a prescient interview from 2002, Saffo talked about the social tensions that emerge from the caldron of rapid change: “… half of society is racing to the future at light speed while another part is trying to recover a past that never existed. That is a recipe for social dynamite. And we see, quite literally, people using tools from the future to drag us back into the past.” Sounds eerily familiar… POTUS meets Twitter? Nightout was short-lived. But it set us on an extraordinary trajectory as storytellers, designers and entrepreneurs. It seems the best advice is don’t just lean in, lean forward.